Star Wars Droid Name Generator 🤖 - VmC Ink. Create an HTML5-based document with various Input Forms and Divs to display results. In the <head> section, add a bit of styling (you can add much more, of course). Next, create Arrays to hold the Types of Droids and Pictures of each. Set up a Function to clear the Form and do any other cleanup. Next up, define a Function that will store the First Name, Last Name, and Date of Birth input. Check that there are no empty fields. Output the User’s Real Name, Droid Name, and Droid Type. Check for good grammar (some Droid Types need an “An” while others need an “A”). Also, display a Droid Picture, from the list in the Array. The actual Droid Name generation is another Function, further below. 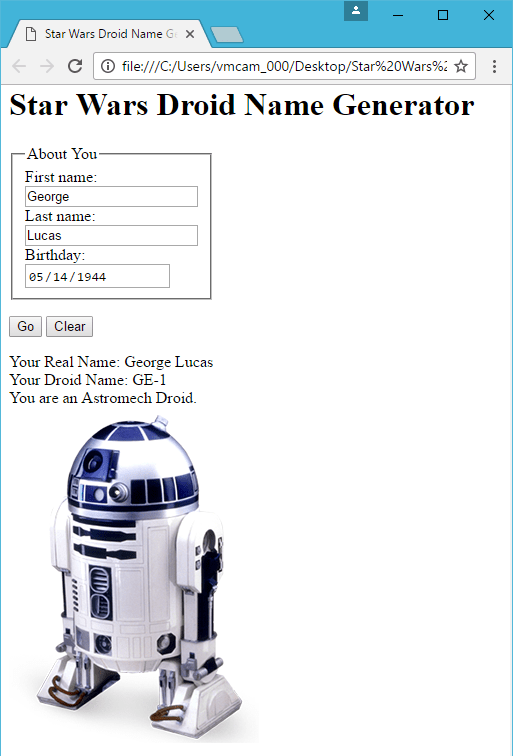 Create a Function to generate the Droid Names. First, take the Month out of the Date of Birth input and store it as a Variable. Check if the Month supplied is actually a number (some Web Browsers don’t recognize the type=”date” Input Field from above); if it’s not, pick a random Month. The trick to generating a Droid Name is to use various Case results. In Case of Month 1 (January), the Droid Name scheme looks like BT-1. Based on the User’s First Name, Last Name, and Month, they get a Droid Name like VC-1. There are a few example Case results (like IG-88 style for August) below, and a Default Case (0-0-0 style) if not every month is accounted for. Using the .slice() method of the Text (Strings) input, we extract pieces of the First/Last Names and concatenate (add to) various symbols and numbers. Finally, return the generated Droid Name. Next, right before the end of the IIFE })(); add Event Handlers to react to Button clicks.